At our Holiday Concert, we made a donation to the Augusta County Library at Fishersville; the money we collect at each Third Saturday Jam there is donated in appreciation of their generous sharing of space for us to meet! BRMDPC has been busy this summer!! 2nd and 4th Sunday Jams by Old Joe Clark’s Cabin at Humpback Rocks Visitor Center have been lovely gathering times. Even on hot days, the shade of the old tree provides a comfortable gathering place where folks stop by to listen and watch on their way to the cabin and trailhead. Our 3rd Saturday Jam in August also took place on the Blue Ridge Parkway, as they celebrated their 100th Anniversary of the National Park Service. In spite of spitting rain as we gathered, we played on and skies cleared. Click here to listen to “June Apple” on our FB page. 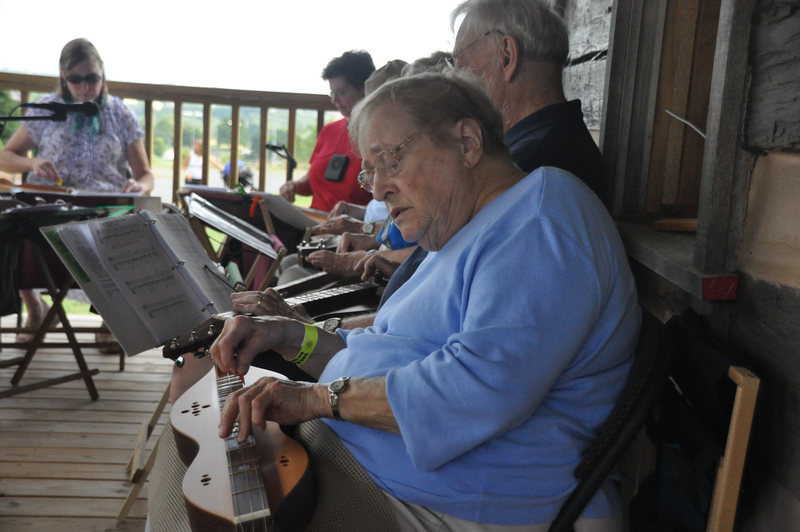 We also gathered to play together at the Sing Me High Festival at the Valley Brethren Mennonite Heritage Center in Harrisonburg on August 27, 2016. Read more below.